TREE: Large shrub or small tree with usu. multiple trunks and dark green leaves. RANGE: Fairly common in riparian zones as a component of mesquite bosques mostly at elevations above 800 m in the Sonoran Desert of Arizona. Occasionally used in landscaping in Tucson and Phoenix, Arizona. 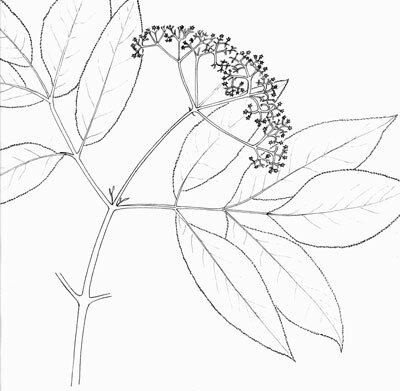 Various taxonomic treatments have lumped or split the Mexican Elder with other populations of the Blue Elderberry that ranges through much of the western United States. FLOWERS: Large, flat topped panicles of small white flowers in mid to late spring and occasionally into summer. FRUIT: Small dark berries, summer to fall. LEAVES: Large compound leaves are opposite on the stems.